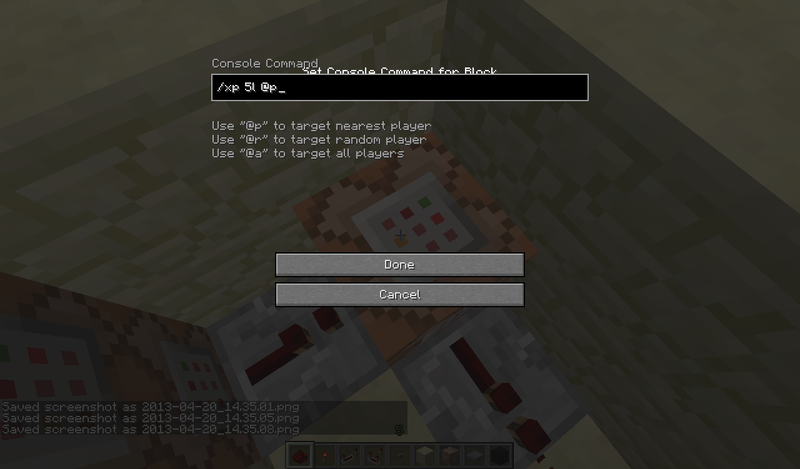 [TUTORIAL] Command Blocks for Map-Making -- Includes Banks, Shops, Scoreboards and More! Poll: Did you find this thread helpful? Poll: Was this thread easy to navigate? 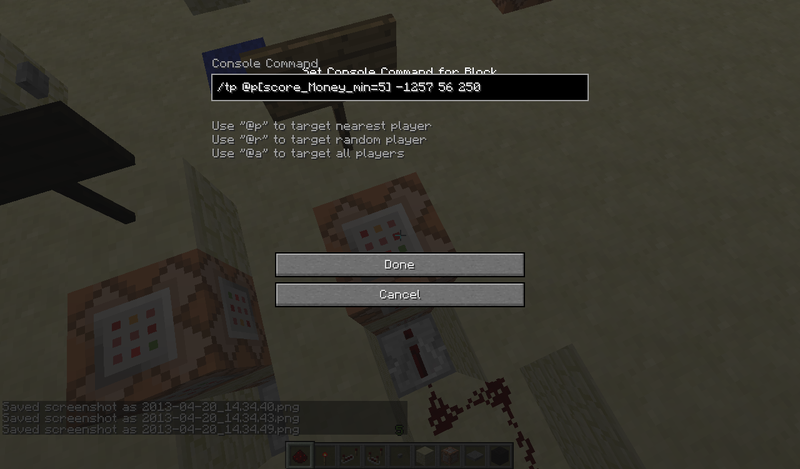 Firstly, you want to start with the scoreboard commands. This is what we will store our levels with. Just for an example, I am only able to store and withdraw 5 levels at a time. You can configure this by adding extra deposit/withdraw buttons, and changing the amount of levels. 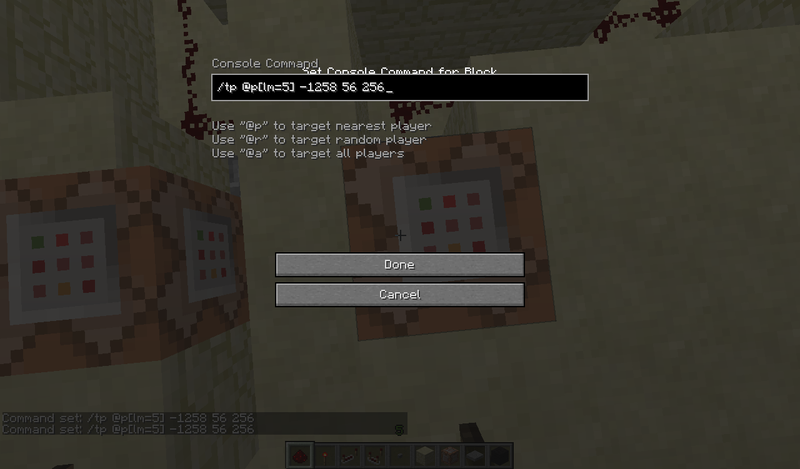 Okay, let's dive into the command blocks! We'll start with the "Deposit" section. As you can see, it's very simple. The player can then use the [TAB] menu to see how much experience they have stored in their bank balance. The experience they have on them is shown above the equipment bar. Only thing with this system is, everyone can see it. There is no way to show the scoreboard ONLY to one player. As for the message you wanted, scoreboard values can't be shown in chat. I'm not sure how you would do this.. I'll update the Weather section now. I need ideas for devices to create! What do you guys want to see? Well, I wasn't going to, as it's something I think I already know how to do anyway. 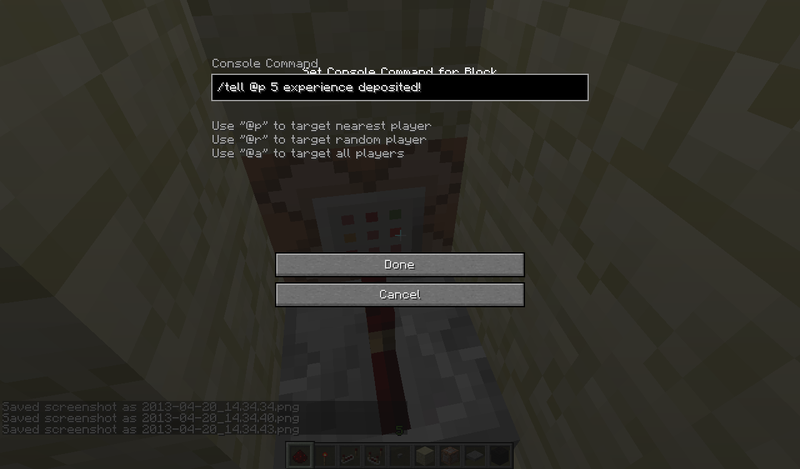 An "advanced" dialogue/quest system where entering an area will activate a set of long dialogue sequences (that will go through different command-blocks of chat-text, only once). But, when the player achieves something; the dialogue will switch to a different set of text, and entering the same area as before will give a new conversation...etc. Edit: If you want to take it a step-further, try adding the ability for the dialogue to have temporary 'quests', that activate when the player finds something (so, activated when they enter a different area, but only speaks when they go back to the chat-area). When the chat+new quest objective for this temporary one is finished, it goes back to the normal, linear, quests+dialogue. Your idea is a lot more clear. Mine was a rough one, just started from scratch. 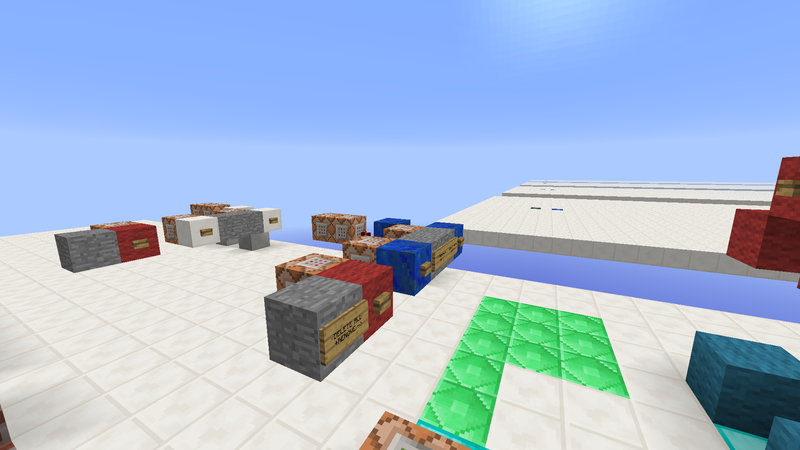 I use /tp as it helps avoid bugging with comparators. I find a lot of the time that, when the player hits a button, the comparator activates, but doesn't switch off. I assume this only happens when using /testfor, though. One thing about your design, though. You can see the command blocks. Here is what I suggest doing. Leave the button wall where it is, but move the whole design to the left. Have the button power a repeater, and have a block infront of that repeater to do the inverter. You should understand what I mean. EDIT: I tested your design, and as I said previously, the comparator didn't switch off. The player would have to leave the targeted radius, then re-enter the area to be able to deposit/withdraw again. Okay, the long dialogue sequences. Upon entering an area, a long length of dialogue follows. When re-entering the area, that dialogue no longer plays. true the command block are at the front, but I guess it depends on how you build the bank around it.. Upon entering an area, dialogue plays. When re-entering that area, that dialogue changes. The events linking of the dialogue change upon re-entering the area. I think the problem is when we do the radius targeting. In the video, he didn't use the radius, and used a dropper instead of a command block to give the item. 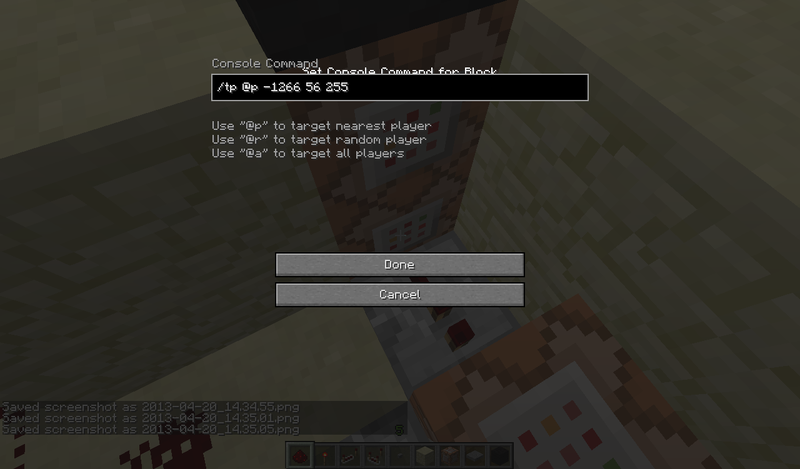 Because we do the targeting argument, the command block is always sending a signal through the comparator. So, instead of having only ONE input signal (which should be [score_NAME_min=#]), it's taking TWO ([score_NAME_min=# and [r=#]), meaning it cannot output them correctly. I suppose the difficulty of making temporary-quests depends on how you've built your quests. Mine's a rather flawed circuit in the sense that as the player progresses (unlocking the next dialogue-phase) so does the delay for the new set of dialogue to start; in other words, dialogue 1 (coloured as iron) has I think a 16-tick delay before it starts, and dialogue 2 (coloured as gold) has 2 ticks added to it; afaik, I have no way to change this. It's hardly a big problem, unless you're making LOTS of these; and there's probably an obvious fix I'm missing. Mines massive, cause of all the repeaters and pistons.. It's really rather terrible, but it gets the job done, at least. I'm not using the dummy scoreboard for mine, but rather /testfor @a[r=#] ... It seems to work rather well. 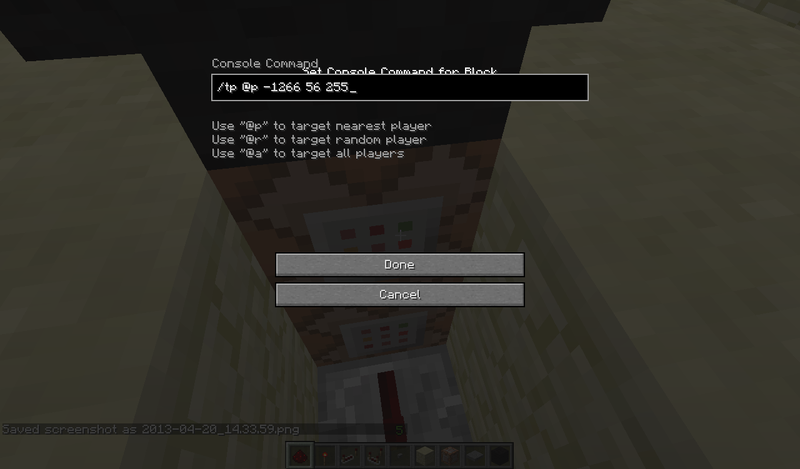 testfor commands checking for increase in scoreboard score, that pushes a piston down to unlock the next RC in the sequence. 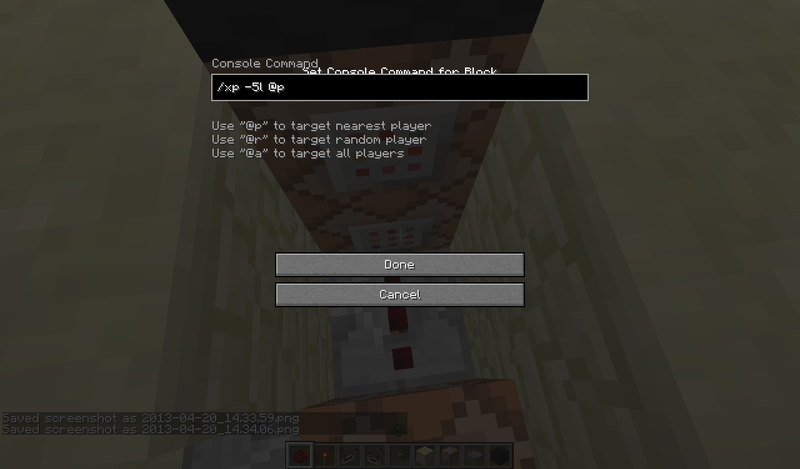 I'm using redstone loops on command blocks like this: /testfor @a[r=4] . 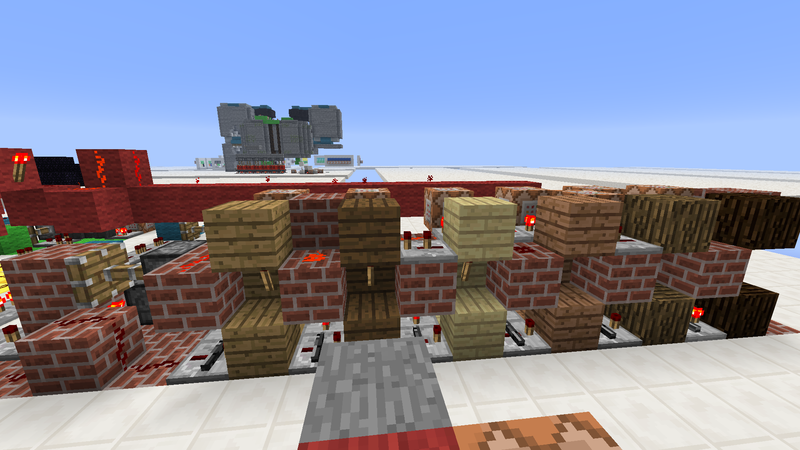 Off that I run a comparator into a T-Flip Flop, then a sticky piston to pull away the block. This stops the dialogue playing a second time. The T-Flip Flop sends a one-tick pulse to a piston which pushes a block which starts the next loop. 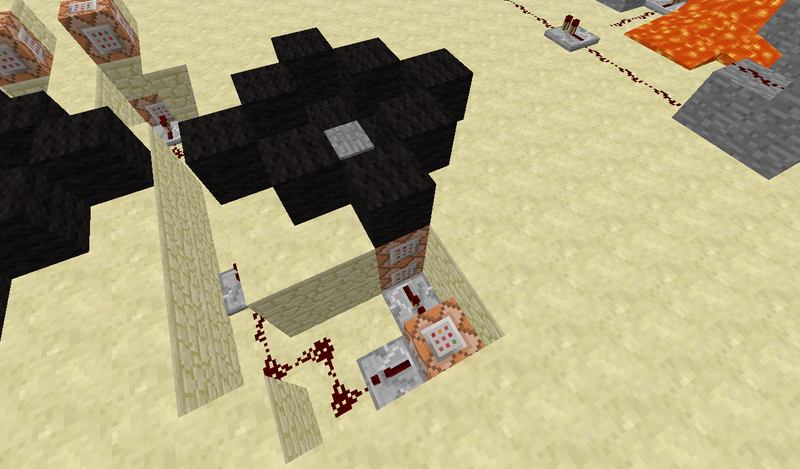 Another piston pushes the block down so the signal is only one tick. So, pretty much, the system goes /testfor, T-Flip Flop, dialogue, next loop. It's simple, but takes up a lot of space. For this, all I'll be doing is subtracting a score-point from the main 'Quest' dummy, while adding one to the 'Side-Quest' dummy. Why take one from the main one? Well, because it already locks into place (only stating it again if the player presses a button), I could easily just have it count-back temporarily, and when the side-quest is done, it just adds it back. I think this should work 100% fine; as, think about it, if they have a Quest dialogue they've not heard yet, and use this, it'll take it away from them for a moment, so when they enter they hear the Side-Quest dialogue, and it will give it them back. Well, seems better than what I've come up with I'll leave you to it. Post it here once you've finished! Everythings everywhere, it's not colour-coded OR labelled... It's disgusting. I gave up on the design. It's up to you, now! Darn, stumbled into a bit of a problem (nothing major, but it's annoying). Because my clock's inverted when inactive (i.e. on when not running to the dialogues); it meant that when it added the Side-Quest dummy, and all the quest-dummy point-testfor CBs get a pulse from the update w/their value (gets decreased, remember? ); it means that I had to switch it around. But this gives the problem of why I had it like that in the first place - delay. Iron/Gold/Diamond = The stages of dialogue, ordered first-to-last. Note that the first one is designed here to NOT require you completing any objectives beforehand. Not Added (but easily done) = because of the way I've designed this, you could easily add some redstone branching off those RS-latches for a player to press a button to hear them again - I was thinking of having a button there to just repeat the last dialogue-sequence, though; or maybe just repeat all that haven't been completed (which can only be max. 2 at a time anyway). 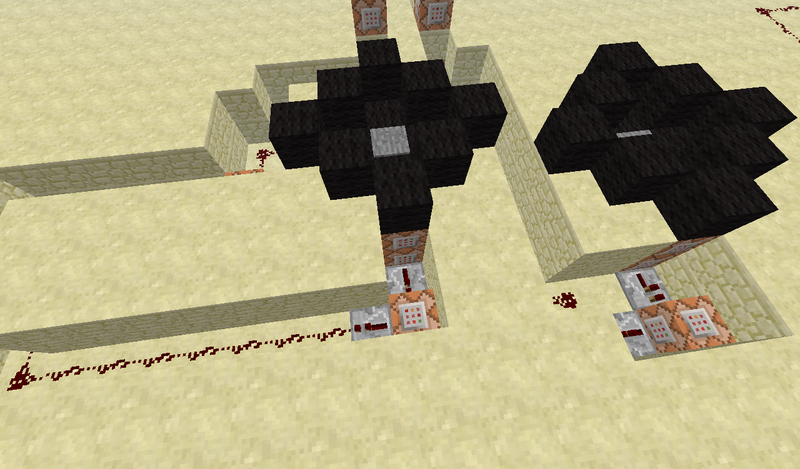 Close-up of the RC circuits I use; this one is the Side-Quest one, but they're all identical. 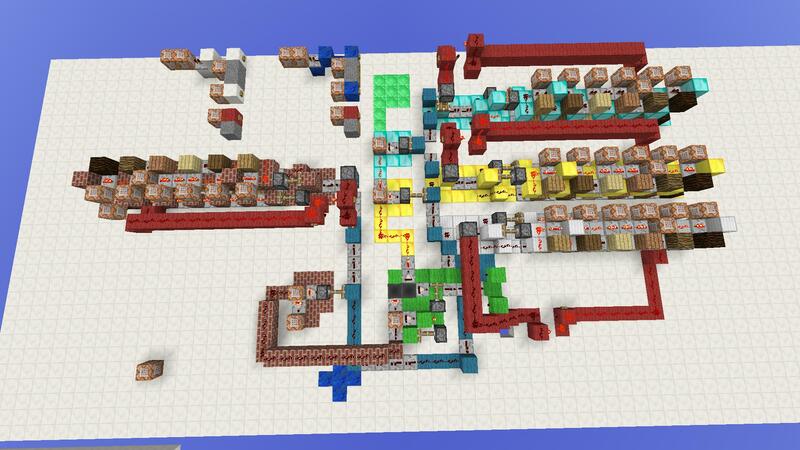 Note that they give outputs on two sides; this is extremely useful for making additional commmand-blocks at the other side in for either debugging, or as extra scoreboard-dummies for specific moments; or, like I used, an easier alternate-output that I used for the RS-latch output. Figured I may as well clarify it before you ask; this here was just for me to add/remove/delete/see points for the dummy-scoreboards 'Quest' and 'SideQuest' (Side-Quest) - lapis=Quest; Quartz=Side-Quest. Anyway, glad I made that! NUUUUUUuuuuUUUuu! I wanted to see what you'd made! Haha, wow! This is wayyy better than what I came up with. Would you be able to make a tutorial on how to build? Take a look at mine, and use the same layout - It'll make it easier. Oh geez; a tut for this will be very hard to do...mainly because of the compacted RCs I use (although they're the only ones to work in this design afaik). Okay, like I said before, I'll make a cleaner-designed version, as this one looks a bit overwhelming, and is a little too inefficient...I'll [i]try[i] to make a tutorial for each individual section (i.e. the clock, the RCs, the latches; etc.) - but I'll probably also add a .schematic file for a version that explains itself, and a more-compact version if I have the time. Will be back soon to post all this. I'm not much of a wiz either.. I don't really study latches and gates and all that stuff, but I usually come up with my own designs. They are usually very inefficient.. I need ideas for things to make with Command Blocks.. What do you guys think I could make? Wow... this is sooo useful. Bookmarked it as a reference. Thanks alot, mate. But how to i change GameRules?